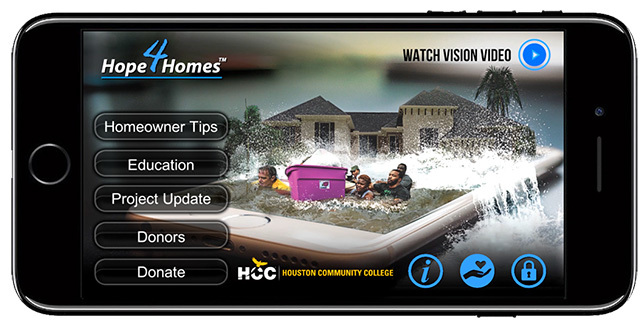 The Hope4Homes mobile app provides video tips, virtual reality scenarios and other resources for dealing with flood-damaged property. Experts estimate that hurricane-destroyed homes could take years to rebuild. A small team of IT leaders in higher education and experts from the building trades hope to expedite the work with an augmented and virtual reality (AVR) training program intended to draw people to the trades who previously would have considered it "dirty, underpaying and uninteresting." Hope4Homes is the brainchild of Jack Werner, a master home inspector for the National Association of Home Builders. Recently, Werner and Todd Feehan, head of Dad's Plumbing in Oklahoma, approached Oral Roberts University CIO Mike Mathews to explore the possibility of setting up an AVR-based trade school that taught students the ins and outs of home inspections, plumbing and related disciplines. Mathews created some demo technology, which, he said, "blew their minds." Since then, three hurricanes, Harvey, Irma and Maria, have swept through parts of the country, and the initiative changed its immediate goal to helping people who were devastated by the storms. Working with 3Dream Studios, a visual marketing company, the group designed a mobile app that 3Dream developed in partnership with the university. Hope4Homes, an app for Apple iOS and Google Android devices, includes video tips from Werner on dealing with flooded and damaged homes, such as how to repair water-damaged drywall and deal with mold. Other guidance resources are included from the Federal Emergency Management Agency and the Weather Channel. Eventually, repair coverage will also include electricity, drywall and landscaping. The AVR scenarios are being developed at the university, which is using Unity, Eon Reality and TalentQuest technology for other AVR projects at the Oklahoma campus, including learning content for its Global Learning Center. The AVR experiences for the Hope4Homes project will work with inexpensive headsets from Google and HOMiDO, as well as others. In addition, beginning on Sept. 26, 2017, Werner will be hosting a series of weekly webinars through the mobile app to introduce the technology to users and walk people through the various aspects of their home reconstruction. "Ultimately, AVR can reduce the time it takes to train people on pertinent skills by 1,400 percent," stated a charter for the program. "This is extremely important as people are making critical decisions to move back into their homes before understanding what to look for." "This is an incredible story that shows how education can truly package innovative solutions that meet world issues," Mathews noted. The latest sponsors for the project include Houston Community College and Carousel Industries, an IT systems company.